The power of family relationships? Tick. Twists and reveals to the plot? Tick. The irreverent tone is set in the first lines of page one when Rory Blaine explains with his droll, Scottish twang that he owes his very existence to a pimple. The first Mrs Blaine died of blood poisoning soon after squeezing a spot while on honeymoon in Nairobi, leaving a vacant chair for the second Mrs Blaine, Rory’s mother. When his parents died in a car crash, his bizarrely intimidating but very rich grandmother, Lady Sybil Blaine, raised Rory until she discovered— quite literally—that he was gay. Now at the landmark age of 45, Rory is a wealthy, successful ad man who seemingly dips in and out of casual sexual relationships with gay metrosexual abandon. He jokes about his therapist, nick-named Ms. Prada, and his genito-urinary doctor called Rod. We smile knowingly with him as he ponders the fate of a “generation of gay men if the fitness revolution hadn’t come along.” But Rory is a swan—all graceful beauty on the surface but with little webbed feet paddling like fury beneath just to keep afloat. Rory is deeply dissatisfied with life, and even Ms Prada can’t seem to help get to grips with it. 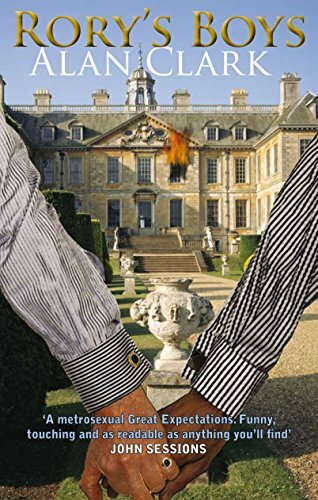 When Lady Sybil dies, Rory inherits Mount Royal, a grand pile of a house in one of the best parts of London. With Vic d’Orsay, a fading gay musician, he sets out to create the first retirement home for gay men; and what a journey! With a cast of memorable characters—from the Calvinistic Miss Wishart of his boarding school days; to Big Frankie, the West Indian cook who rides a lilac scooter—the crumbling pile is slowly, painstakingly restored to its former glory and made ready for its gloriously camp well-heeled residents. Of course, during the process, Rory staggers from one crisis to another and though there is some overly convenient tying of loose ends, it is a raucous and riveting tale that conjures up beautifully the decadence of London and the gay scene. Author Clark brings both tenderness and practicality to this world and particularly Rory’s love affair with Faisal, a younger Muslim doctor. He stings the reader with the poignancy of Rory’s desire for a soul mate, to belong to one person, the human needs that transcend gender and sexuality. As Rory struggles to hold down the relationship amid religious prejudices, one-night stands, an accidental death, and revelations about his family, he confides in the reader how he truly wishes he were not gay. Rory’s Boys will undoubtedly be acclaimed as one of the most funny books of 2011, and is deserving of a wide audience—albeit a broadminded audience as it is very explicit. But it is the insightful, tender way Mr. Clark deals with the important underlying issues that will make this book a classic in its own genre—and hopefully within the mainstream genre, too.